The fight between Madhu Kapur, widow of bank's co-founder Ashok Kapur, and current Managing Director and CEO Rana Kapoor is not about money. Over 200 people had gathered at the auditorium in Nehru Centre, the white cylindrical building on Dr Annie Besant Road in Worli, Mumbai, on June 8. They were the shareholders of YES Bank, the country's youngest private bank, and it was their annual general meeting. In previous years, such meetings were a non-event. This year, it promised high drama - a fight had broken out between the two promoter families, one led by Managing Director & CEO Rana Kapoor and the other by his sister-in-law, Madhu Kapur. Fireworks were expected. Rana's wife, Bindu, and Madhu are sisters. Madhu's husband, Ashok Kapur, and Rana had started YES Bank together in 2004. [They had shortlisted five names for their bank: Mint Bank, My Bank, Gateway, Octra and YES Bank]. "The brand reflects the mood of the nation, (it is) a part of the country's momentum," Rana had told Business Standard in 2005. That, after all, was the age of India Shining. The two partners complemented each other well. "I am the "poor" one of the two," Rana would say, commenting on the similarity of their surnames. A banker who knew both says Kapur was more of a backroom person, while Rana was the public face of YES Bank. "Kapur gave strategic directions and left the day-to-day affairs to Rana to manage," says a senior executive of a global consultancy. 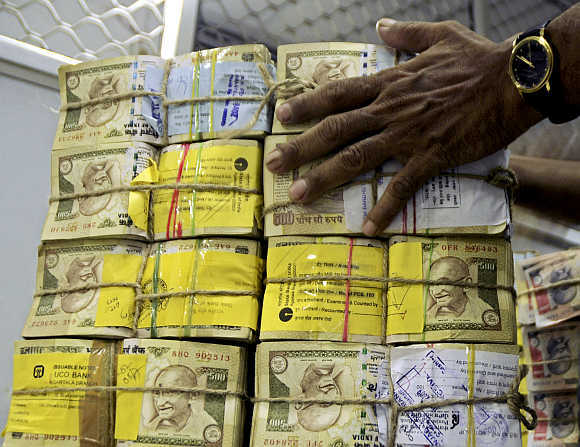 Image: A cashier counts rupee notes inside a bank in Amritsar. "Kapur was different when compared to Rana," says Wouter Kolff who served on YES Bank's board for eight years till May 2012. "Kapur was a banker of old times: very solid, good at risk management. Rana is much more of an entrepreneur and won't take no for an answer." Four years after setting up the bank, Kapur had gone for dinner with his wife, Madhu, to Kandahar, the Frontier food restaurant in south Mumbai's Trident Hotel. The day was November 26, 2008. As they were having dinner, two gunmen appeared in the restaurant and started firing indiscriminately. The 26/11 terror attacks on Mumbai had begun. The Kapurs tried to run out of the door but got separated. Madhu managed to get out of the hotel complex. After two days, she discovered that her husband had been shot dead along with a dozen other guests. At the time of his death, Kapur owned 12 per cent of YES Bank (Rana owns 13.72 per cent). Those shares are now owned by Madhu. It has now come to light that sometime in 2009, Madhu had asked to be inducted on the board of YES Bank. 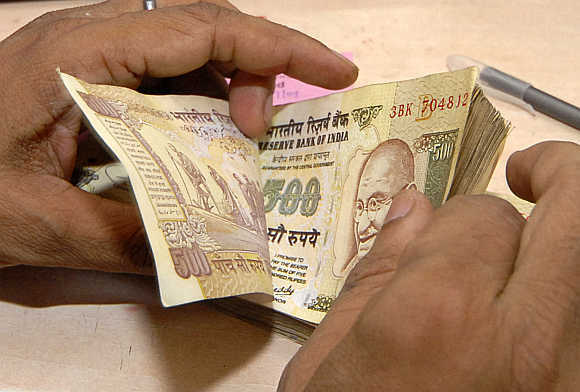 Image: A cashier counts rupee notes inside a bank in Lucknow. "The request was discussed by the board at that time. It was found not in accordance with the 'fit and proper' guidelines of the Reserve Bank of India and the board decided to reject it," Rana had told Business Standard earlier in the week. He also called it a "one-sided dispute raised by Madhu". Rana subsequently declined to be interviewed for this article. People close to Madhu say that she had made only a verbal request, not a formal one, and was asked to wait for a couple of years. S L Kapur, who served on the YES Bank board for eight years from January 2005 to January 2013, the last five as chairman, says Madhu had met all the board members with her request. The crucial factor here is the 'fit and proper' guidelines that banks need to follow while appointing a director on the board. A circular issued by the Reserve Bank of India on June 20, 2002, defined these as formal qualification, experience, track record, integrity et cetera. It said the candidate should be a graduate, between 35 and 65 years of age, and not a Member of Parliament, Legislative Assembly or Legislative Council. On June 25, 2004, RBI issued another circular which said that banks "should undertake a process of due diligence to determine the suitability of the person for appointment as a director on the board based upon qualification, expertise, track record, integrity and other fit and proper criteria". Madhu is a housewife and is not known to run any business. S L Kapur, who chaired the meeting in which Madhu's request was discussed, says board members need to have years and years of experience in their respective fields. "For instance, I was representing the small-scale sector (he worked as secretary in the department of small-scale industries) and Radha Singh (former Union agriculture secretary) represented the farm sector," says he. "We did discuss Madhu's proposal and felt she was not eligible." On the surface, everything looked normal. Some months back, Madhu and her children, daughter Shagun Kapur Gogia and son Gaurav (he has a restaurant business), had attended the wedding of Rana's daughter, Rakhee. 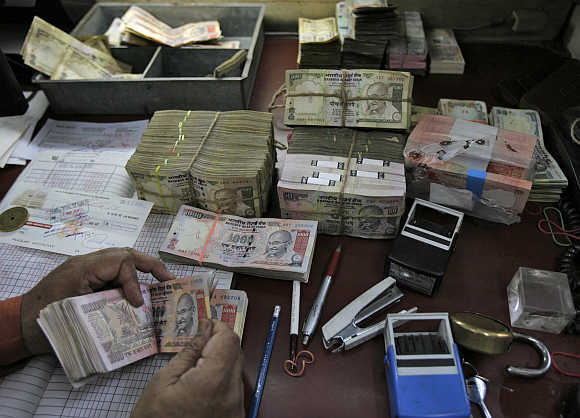 Image: An employee sorts rupee notes at a cash counter inside a bank in Agartala, Tripura. "It looked like one big happy family," says a person familiar with the developments. Beneath the surface, there was discord. In 2011, Madhu found her name missing from the list of major shareholders in YES Bank's annual report; it only mentioned Rana. She raised the issue with the company secretary, but was told that this was done to make the disclosure "easier". When the information was left out in the next annual report, Madhu was disturbed. "They (Madhu and children) felt as if attempts were being made to erase Kapur's name and attribute all the credit for the bank's success to Rana," sources say. In response to an email query from Business Standard, Shagun, Madhu's daughter, says: "An attempt to erase my father's name and our family's identity with YES Bank disturbs me the most." Though there has been talk that Madhu and Shagun approached YES Bank again in 2011 for a board position, Shagun denies it. "To the best of my memory, in 2011 neither I nor my mother asked the bank or Uncle Rana to consider her appointment." The fight is decidedly not over money. Both the families are fabulously rich. Madhu's 12 per cent stake in Yes Bank is worth Rs 2,060 crore (Rs 20.6 billion), while Rana's 13.72 per cent is valued at Rs 2,356 crore (Rs 23.56 billion). 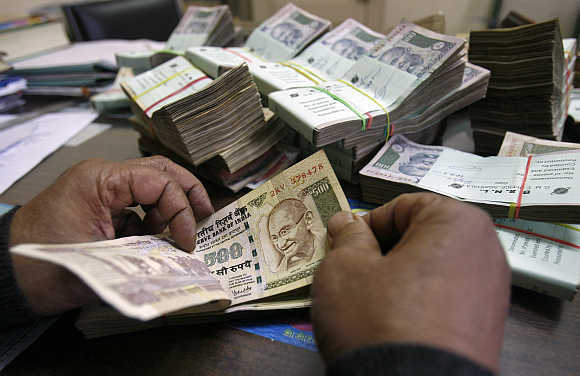 Image: An employee counts rupeee notes at a cash counter inside a bank in New Delhi. In May this year, Madhu and her children realised that according to the articles of association of the company, they have the right to jointly nominate three directors on the YES Bank board along with Rana. 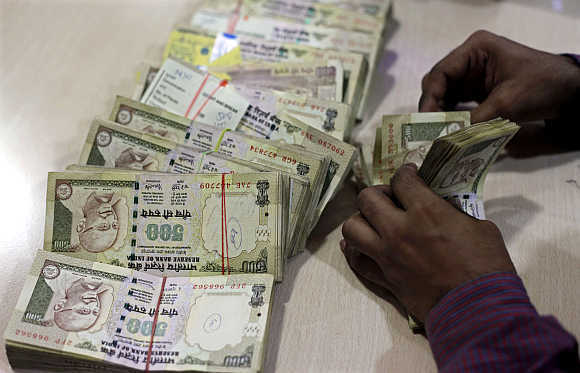 In October last year, the bank had taken on board three new directors: Diwan Arun Nanda, the 69-year-old promoter of Rediffusion; Ravish Chopra, 65, an HSBC veteran of 44 years; and MR Srinivasan, 69, who worked with RBI for 35 years before joining IDBI. Two of them, Chopra and Srinivasan, were Rana's nominees. Madhu felt, according to the articles of association, she ought to have been consulted. On June 5, she sent a letter to Rana and Srinivasan that her daughter, Shagun, should be nominated on the board. Shagun, who is married to Naveen Gogia, the head of marketing at HDFC Asset Management Company, is a double major in economics and biology from Tufts University and an MBA from the Indian School of Business, Hyderabad. She did a three-year stint with private equity fund ICICI Ventures where she was a part of the team that closed five deals with equity investment of around $100 million. 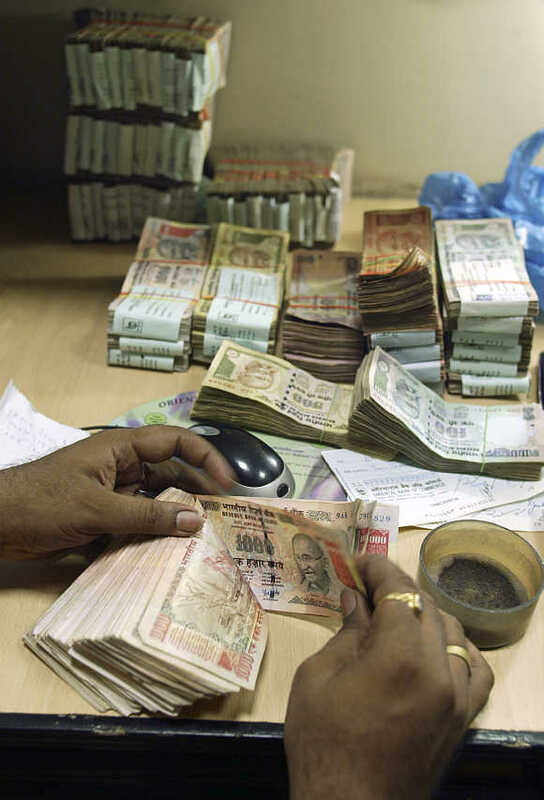 Image: An employee counts rupee notes at a cash counter inside a bank in Mumbai. She then worked for three years at Rabo India Finance on mergers & acquisitions and private equity placements across sectors like information technology, BPO and biotechnology. She founded investment firm Tuscan Ventures in 2007, which focuses on private equity investments, strategic consultancy and incubating operating businesses, mainly in the logistics space in India and Asia. In a media interview, Shagun said she expects returns of around 30 per cent from Tuscan's investments. Three days after the letter was sent, the 9th AGM of YES Bank's shareholders was scheduled. There were 10 items listed on the agenda, including the appointment of the three directors. On June 6, at around 4 pm, Madhu and her two children filed a petition in the Bombay High Court to stay the AGM. An hour or so later, they received a reply from Rana that the matter would be discussed at the next board meeting on July 24. On June 7, the court declined to stop the AGM. The Nehru Centre AGM, scheduled for June 8, was on. Madhu, as expected, objected to the appointment of the three directors - the other seven resolutions were passed. It was put to vote. Shagun was allowed to be an observer. 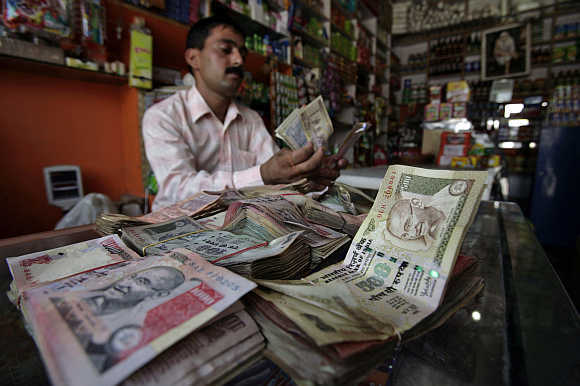 Image: A shopkeeper counts rupee notes inside his shop in Jammu. Two days later, it was announced that 80 per cent of the shareholders had given their nod to the appointment of the three directors. Madhu may have lost the battle that day but the small shareholders (except those who were also employees of YES Bank) were vocal about her rights after the AGM. Many of them said that her rights as a promoter of YES Bank ought to be respected. Incidentally, few spoke about Shagun's elevation to the board of directors. "YES Bank is doing a great job as far as business is concerned. We have no complaints in this regard," said Pawan Seksaria whose family owns a few thousand shares. "The other family also has an equal right which cannot be denied just because you think that your power will get diluted." On June 10, the Bombay High Court said that the board of YES Bank should meet on June 27 to consider Shagun's appointment on the board. The outcome of the meeting has to be reported to the court on July 1. At the moment, Rana is the only promoter on YES Bank's board. With seven directors, it is a lean board. If Shagun is co-opted, will it open the gates for Rana's three daughters? Radha, the eldest, who studied in the University of Arts in London and Parsons The New School for Design in New York, set up Doit Creations in 2009 to promote new creative ventures. 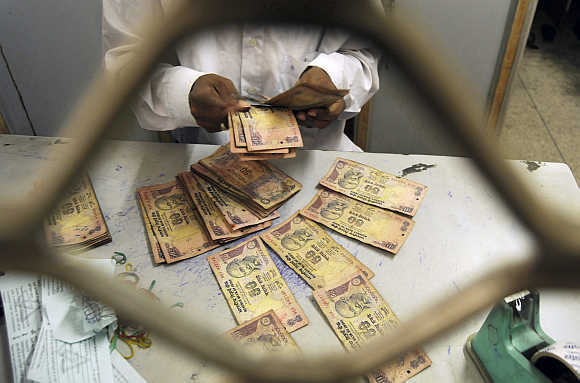 Image: An employee counts rupee notes at a cash counter inside a bank in Agartala, Tripura. It started with a premium dry cleaning service, Pressto India, which currently operates 16 stores in Mumbai and New Delhi. Doit Creations has also started a 'wallscaping' business named BrandCanvas in partnership with Alok Nanda, a creative designer. She is in the process of launching the Indian School of Design and Innovation in Mumbai, followed by New Delhi. Rakhee, the second, after her MBA from Wharton, did internship with YES Bank after taking permission from the board and worked without any remuneration. Sources say she no longer works in YES Bank. The youngest, Roshini, has recently completed her schooling and is now in college. Rana was unequivocal about representation on the YES Bank board in the earlier interview: "One cannot just induct his or her relatives on the board of a bank." The YES Bank stock has slipped over 6 per cent in the last one week. The dispute needs to be resolved quickly. An out-of-court settlement isn't improbable. "It will be nice as nobody wants a situation like this. We will certainly favour an out-of-court settlement," a person close to Madhu says. Till then, all eyes are on the June 27 board meeting. 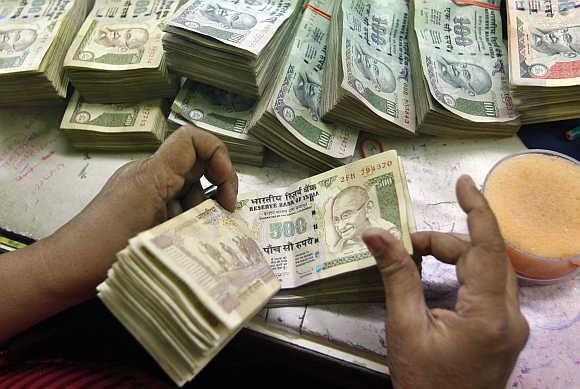 Image: An employee counts rupee notes at a cash counter inside a bank in Kolkata.